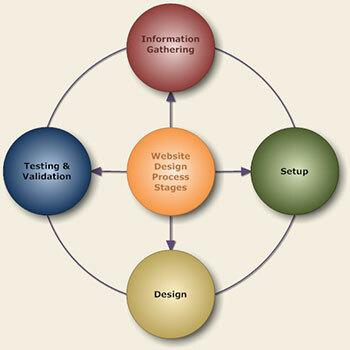 Oongawa Design performs a four stage process when developing websites. These thorough processes ensure that each website is built to solve the needs of the customer and perform to web industry standards. Information Gathering This stage is where we collect information about the company, its competitors, general search engine data and review the company's marketing material. Domain & Website Setup In this stage, all of the setup involved with registering a domain, hosting a domain, e-mail accounts and installing special software is performed. Website Design The website design stage encompasses the actual creation of the website, including graphic mock ups of the home page, secondary page templates, adding content and basic search engine optimization. Testing & Validation The last stage involves testing the website to make sure it works properly, has no broken links and adheres to industry web standards so that it displays properly across multiple browsers and devices.